The suspension is allowed to compress, but not to drop. This prevents the vehicle from rising up due to centrifugal forces during high-speed turns and heavy use of the lean control lever. This is accomplished by placing a lost motion bolt through the resilient polyurethane elastomer between the upper A-arms. The net effect is a tight, road-hugging performance. • The drive-side pulleys are constructed with a full width, .25 thick band of 80-durometer polyurethane rubber for the chain to ride on. This is sandwiched between beveled nylon cheeks and makes for a virtually silent pulley, which holds up well, and is cheap enough to replace if needed. • The all-rod linkage steering is nice and stiff, no mush. • One advantage of the vehicle’s design is a relatively low BB (bottom bracket) compared to the seat height. For most riders this means better strength due to the workings of the cardio-vascular system – not true for all riders, but sure is for me. However, depending on how laid back you want to adjust the seat, this will make for a more open body posture, which you may or may not like. It also affects how secure you are in the seat, and creates a tendency to slide down if you’re pedaling lightly. So you might want to specify a higher BB, or a lower seat, or a bit of both. • The lean lever functions as an assist; it is not an absolute control. It’s purpose is to allow ultra low speed, convenient stops, stability in a cross wind with a fairing, and such. It has sometimes given new riders a false sense of security and caused them to be surprised when they reached the limit of the vehicle’s stability. Therefore, practicing on the grass while wearing gloves is the safe way to get to know the vehicle. With experience, one should not expect to fall on this vehicle any more than you would expect to crash your car. • The left handlebar controls the steering, and the right handlebar controls the lean. This seems very strange at first, it did to me, but like driving a stick shift, it does become natural with a little practice (about the same as learning a clutch). It helps a lot that there is a pattern to it. Namely, if you turn your head and shoulders to look towards the direction you’re turning the vehicle, your hands will follow. This generally results in moving the handle bars in opposite directions (fore and aft), unless you are on a reverse-cambered turn at low speed. • Rather tight, low-speed turns can be made, but pedal interference with the tire does occur on a radius of less than 14.5 feet. Fortunately, the same pattern mentioned above applies here as well. When your left hand goes forward, so would your left foot, thus allowing a tighter turn. Using this technique for avoiding pedal interference does become more and more natural with experience, and is a worthwhile compromise, because it allows for the existence of such a very narrow, low-BB vehicle, with enhanced braking power due to the significantly rearward sitting position of the rider. I have made the left master responsible for controlling both front wheels. This works for me. Using a separate master for each front brake is an option, since pull is relatively less on such a narrow vehicle. Front wheels use floating 3-ball pit pins, which require only 1 ½ turns. Front fenders use expanding circlips on tapered nuts, which require only 1 ½ turns. Rear Wheel uses the usual dropouts. Handlebars use a through-skewer and D-washer, and fold down inline with the frame, and can then be secured with Velcro ankle straps. Seat clamp bolts have self-aligning tips. 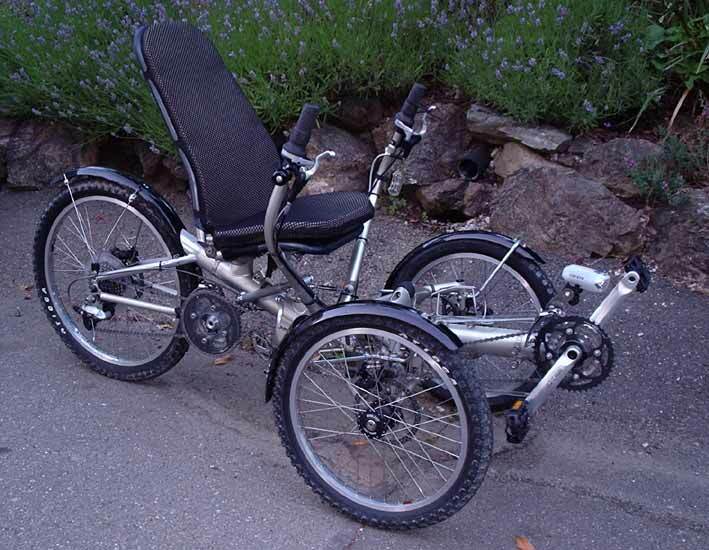 Wheels can be Velcro-strapped together for transport, giving protection for all 3 rotors. The studs, which are pressed into the ball joints of the A-arms and steering, are welded using heavy copper chill bars to prevent loss of temper. The main frame’s tubes are made from .04 4130 sheet that is press-rolled, and seam-welded utilizing backup gas over copper chill bar, along with extensive fixturing, to prevent buckling of the seam during the welding process. Uniform thickness of bearing housings is maintained by using tight-fitting split copper chill plugs during welding. Bearing housings are post-weld bored.